This is a conversation that we have on a weekly basis, so its time we put pen to paper (finger to keyboard) and came up with some reasons. Specifically we are talking about our core range of manifolds which is the Toyota JZ engines and Nissan SR/RB engines, there are many manifolds for these engines on the market however we go through a few extra processes to ensure that they are the best you can get and a product we are proud to put our name on. 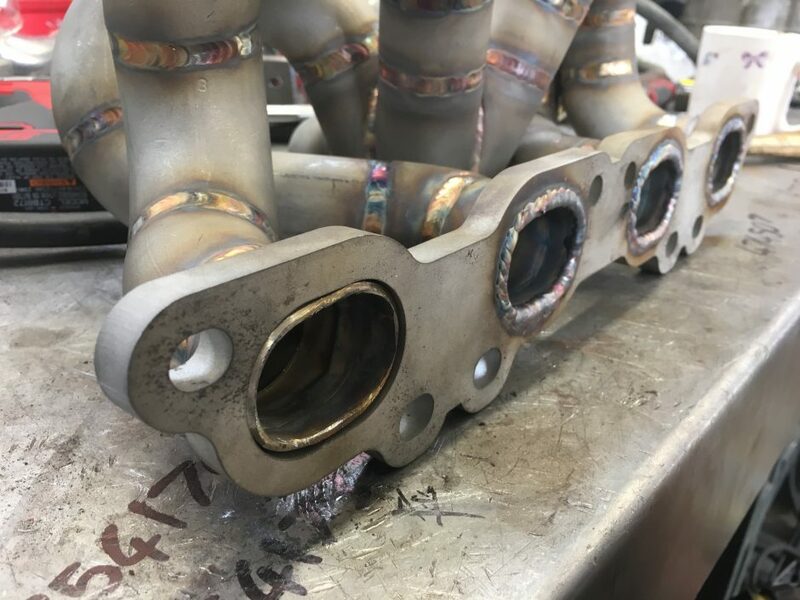 The Primary job of an exhaust manifold is to get the exhaust gasses out of the cylinder and in the case of the turbo engine, past the turbos exhaust wheel spinning it as fast as possible. 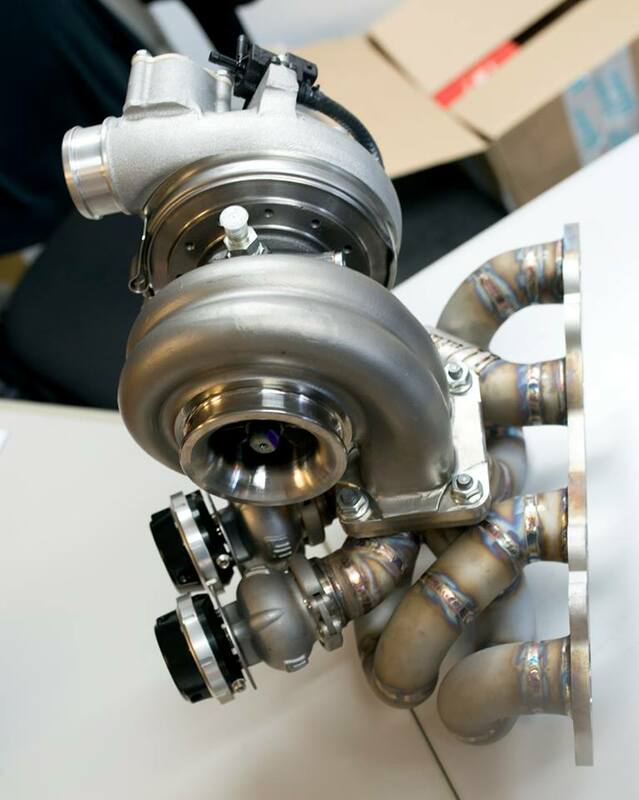 This is the easy bit of process, but we are going to talk more specifically about the strength and durability of the manifold, and also touch on turbo health. We will start at the cylinder head end of the manifold, as that is where the exhaust gasses first enter the manifold. 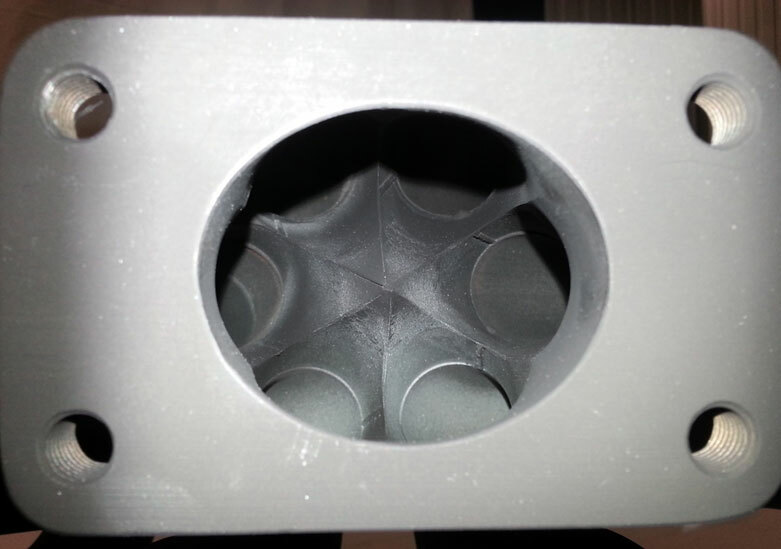 We design all of our flanges in house and have them Water Jet cut from 10mm 304 Stainless steel for increased accuracy over traditional laser cutting, it also creates a better aesthetic look than laser cutting. 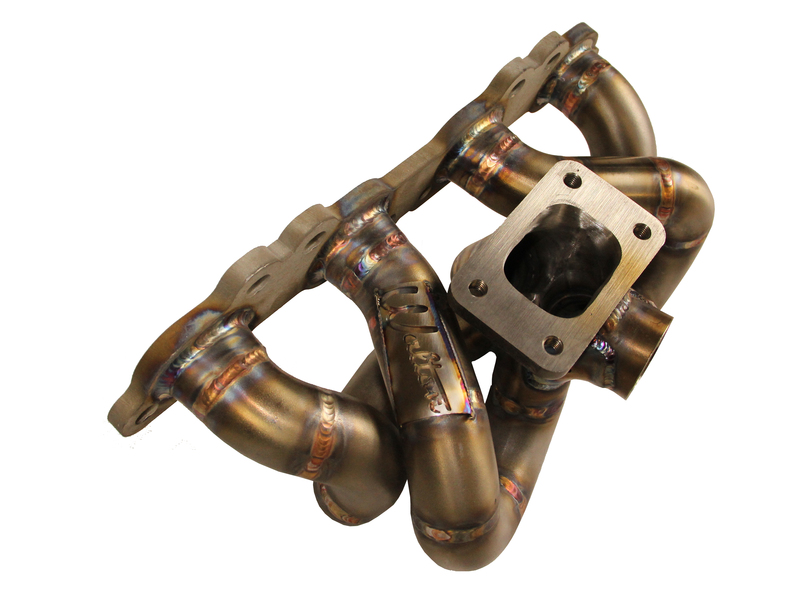 We use 304 Stainless Steel for the full construction of our manifold to prevent corrosion. 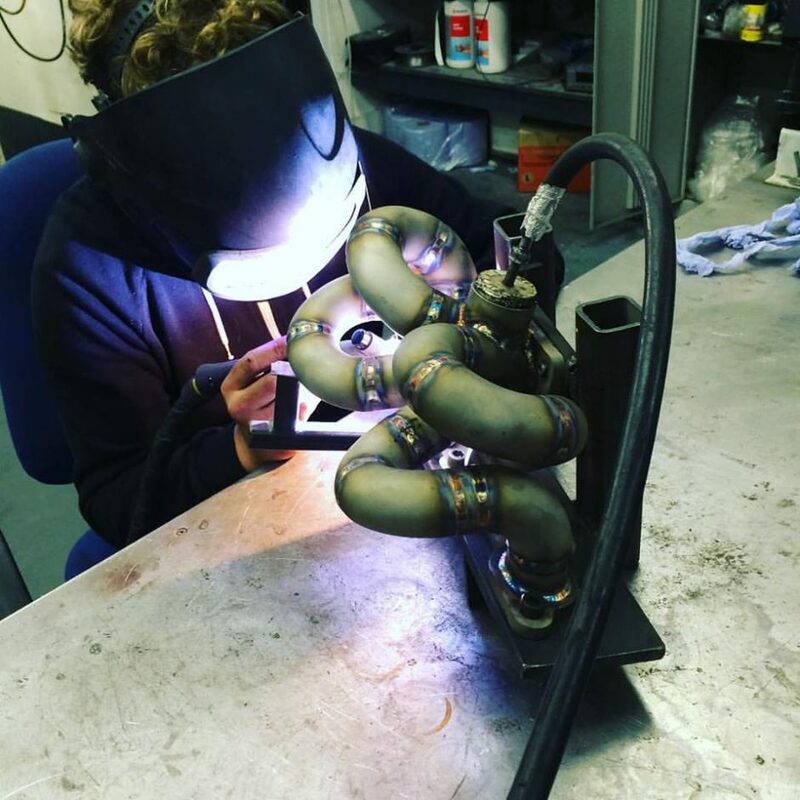 The Primary pipes are the tubes that go between the head flange and the turbo flange, Most of our competitors weld the primary tube to the face of the manifold, Whereas we use a stub, which is pushed through the flange and welded front and back to create a super strong base to support the turbo. 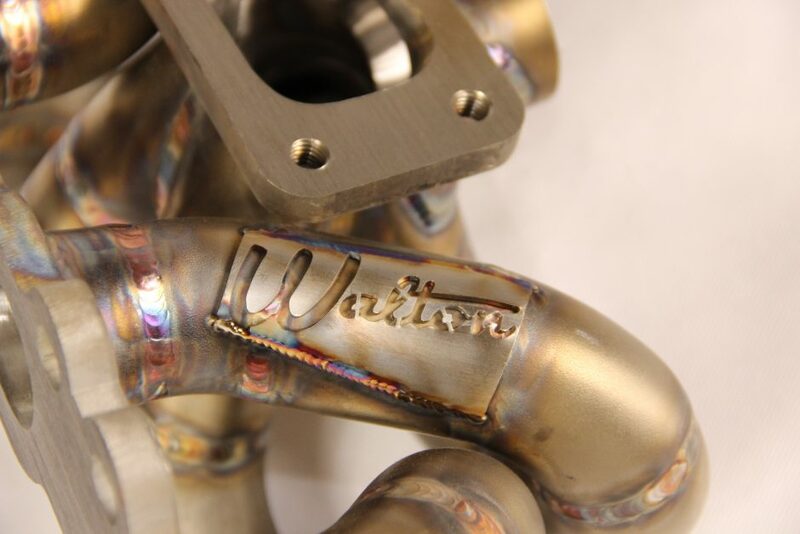 The below picture shows before and after welding. we of course port and flatten the flange after this process to ensure best possible gas flow. This is a process that to the untrained eye is difficult to spot, you will generally know if a brand does this or not, because they will shout about it. The primary pipes are then back purged and TIG welded, Back purging is the process of flowing Argon Gas (in the case of Stainless Steel) through the inside of the pipe, The argon creates a shield over the back of the weld preventing the molten metal from reacting with air in the atmosphere and creating a rough weld on the inside of the primary pipe helping to promote the best possible flow, we also like to keep the manifolds compact in the primary pipe routing but allow fitting to be as easy as possible and utilise stock studs and bolts where possible. We make our merge collectors in house rather than buying them in, A popular option in other brands is to use CNC collectors, where these can look really great aesthetically it does not allow such flexibility on design due to the nature of having to make them in batches in order to keep costs reasonable. 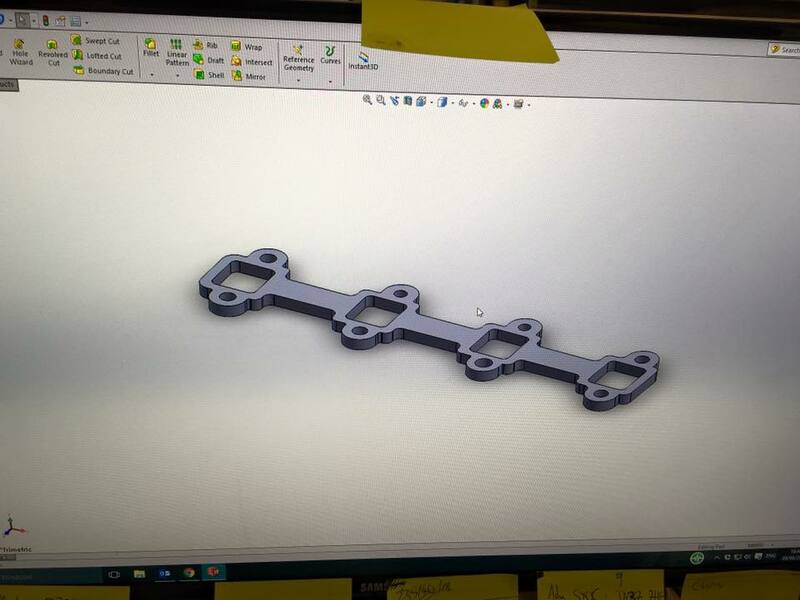 Building our own collectors allows us to ensure each one is built to our quality standards and exact specifications allowing us the ability to modify design to suit each manifold and application. 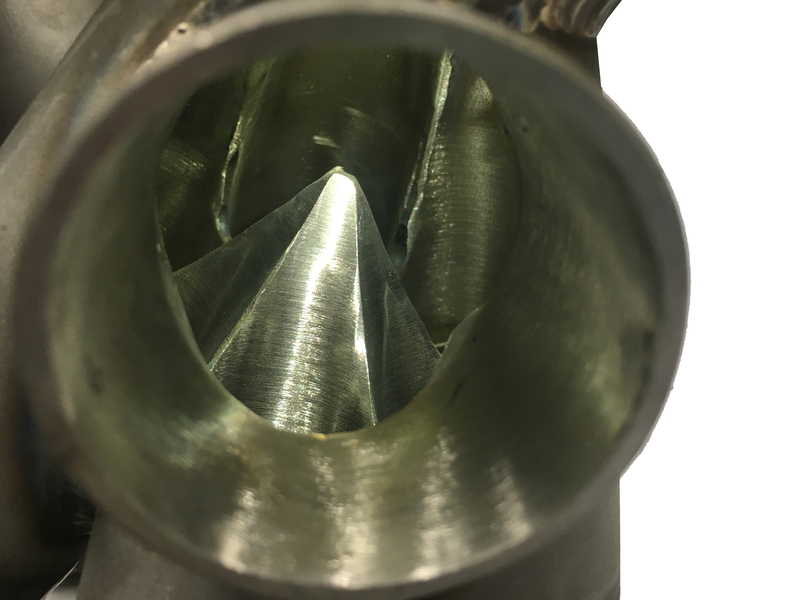 We weld our collectors internally and externally before porting the inside back to a smooth point. 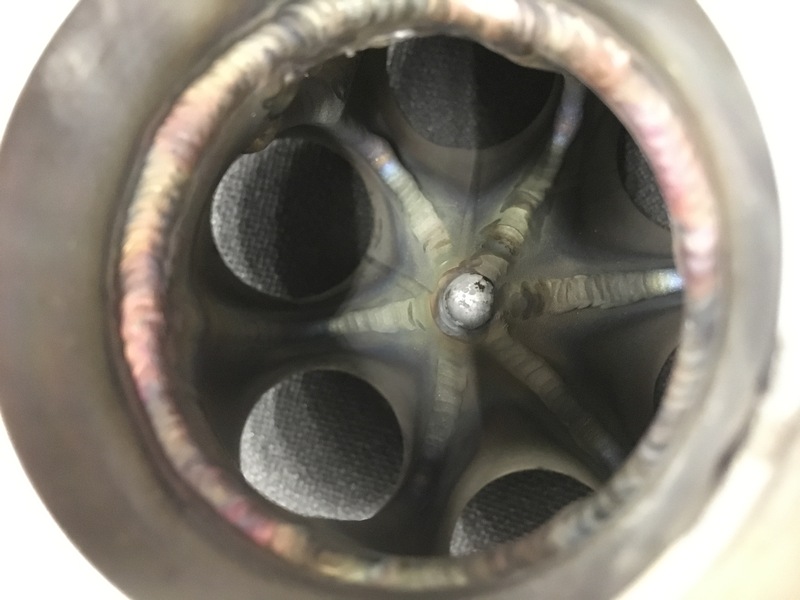 Most of our competitors don’t weld the inside, not only does this increase strength, but it eliminates the risk of metal fragments breaking off with the heat and making their way through your expensive turbo. 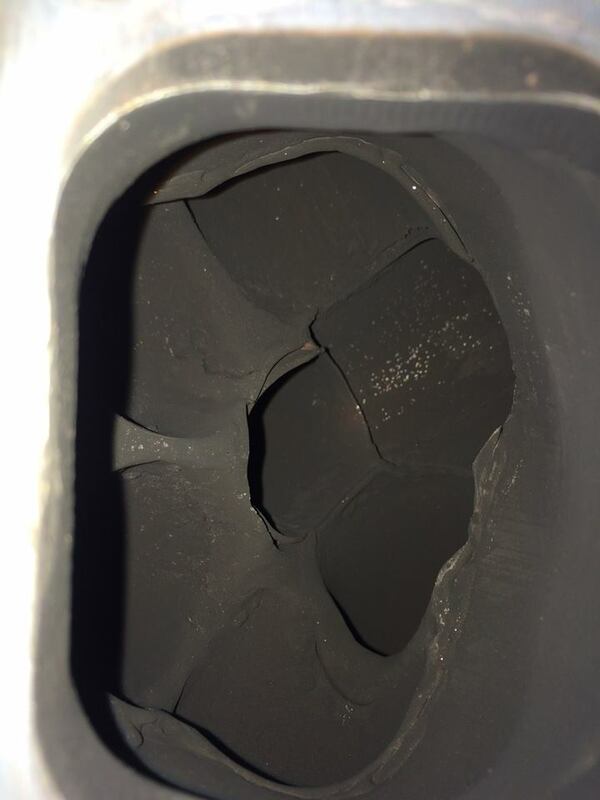 The Image below shows the internals of a failed collector that has not been internally welded, this particular manifold was one that we removed from our R34 Skyline (fitted before we purchased the car) that had led to subsequent turbo failure when the particles passed through the propeller wheel. We also keep the port in the flange to the correct shape, rather than short cutting it to an oval. 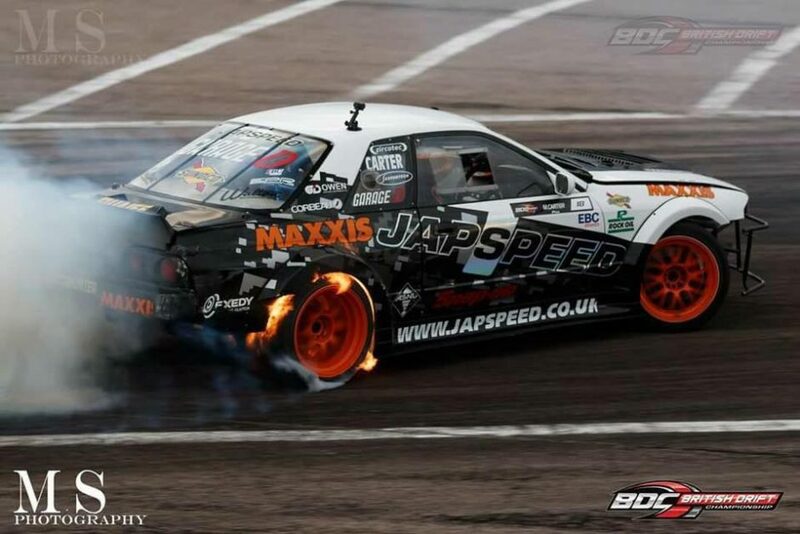 this will of course give the best possible flow on our manifold for more power. 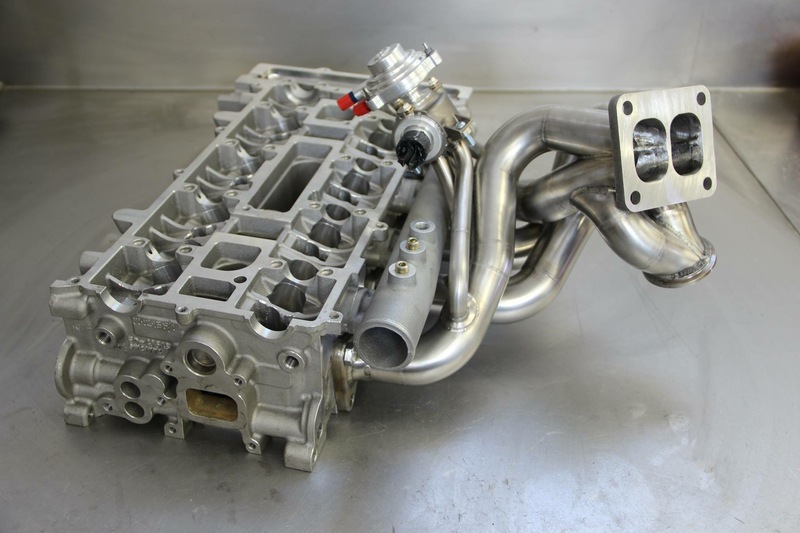 We can also produce a manifold for any application, as well as using the super alloy Inconel which is predominately mainly used for F1 and Rally applications, As shown in this WRX Citroen setup complete with fresh air antilag. Lifetime Warranty – Most aftermarket manifolds offer this, offering the warranty is easy but the more tricky bit is eliminating the need to use it, if your manifold happens to break its great that its covered but its even better if it never broke in the first place, the extra steps that we have spoken about, help to significantly reduce the risk of a failure. 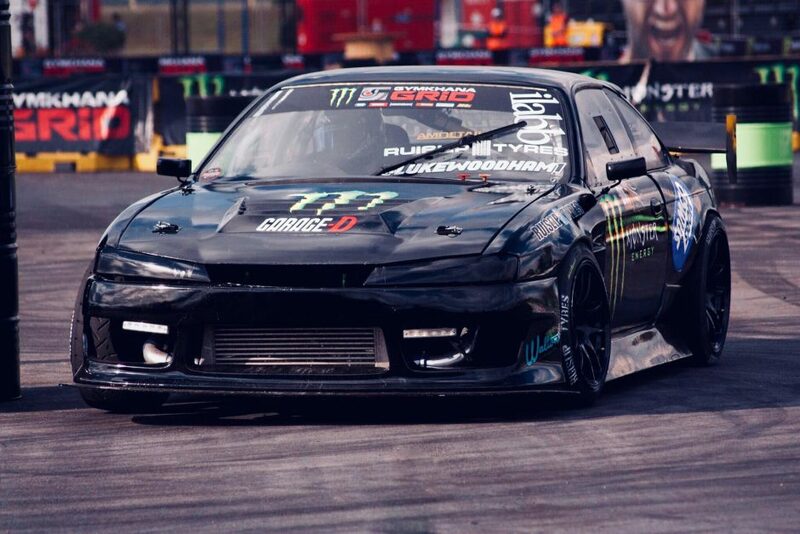 The benefit of this is that you spend less time with the car in bits and a track day or drift day isn’t cut short.